“Innovation comes out of sheer desperation – you just sit down and do it!” This sentence, on the origins of innovation, struck me while talking to one of the area engineers from the eThekwini Water & Sanitation Unit (EWS) in Durban. I was there in June on behalf of the IDB / MIF team and the Innovation and Technology for Development Centre of the Technical University of Madrid (itdUPM) to prepare a case study on innovative business models for WASH.
We had been discussing some of the technical, financial, social and business innovations developed and then delivered by EWS across the municipality to increase or enhance service delivery to the un-served. Necessity is clearly a major driver for innovation – but can innovation (of any nature) on its own have the impact we need to provide services to all? During my week with EWS I saw how the potential for developing innovative ideas and approaches can best be harnessed by an organisation that has an enabling and open culture; where an ethos of incremental learning and a willingness to learn by doing goes hand-in-hand with evidence-based strategic decision-making. Community stand-post, Frasers informal settlement. Tongaat: Phindile Nyawose, EWS. Since the extension of the municipal boundaries in 1996 to create a Metro and then again to become a ‘Unicity’ in 2001 (EWS, 2012), the current ‘customer’ base of EWS has significantly increased to over 3 million people – with many living in informal settlements and rural areas. Given current water and sanitation coverage and funding levels it would take 29-37 years to provide everyone with an in-house water supply and an estimated 23-28 years to deal with the sanitation backlog (EWS, June 2012). To meet this huge need and to address technological, financial, environmental and practical constraints (Sutherland, 2012) EWS had to act creatively to develop different types of service delivery for different customer segments and to get buy-in from communities, politicians, the media and others for this spatially differentiated approach. By working through various multi-stakeholder partnerships with the private sector, civil society, academia and donors, EWS has sought to leverage the skills, capacity and knowledge required to rise to the challenge. This proactive multi-disciplinary, multi-stakeholder approach aims to unearth and meet the ‘right’ incentives for all partners. For the communities, this is primarily about job creation and livelihoods; for the private sector it’s about providing clear and rewarding contracts; for academic partners their research can be ‘tested’ at scale and grounded in reality; for the municipality, public health and environmental protection remain key. The Head of EWS, Neil Macleod, described to me how progress can best be made through this multi-stakeholder approach as it links together EWS’s strategic operations with informed, evidence-based research, by innovating with new, environmentally sustainable technologies and most importantly, by getting feedback through proactive community engagement (i.e. the human element going hand-in-hand with the managerial and technical). From each operational area of EWS’s approach (the social, technical, environmental, financial) I was able to witness examples of innovation – not only that, I also found an organisation whose culture positively encouraged its staff to learn incrementally and provided the space to try new things. As my engineer contact went on to say, “You can get things wrong… but you only do it once and you learn from mistakes!” This solutions-based approach, articulated by the staff I met from across EWS and their partners, was heart-felt and inspiring. As with BPD, EWS recognises the importance of “the human element “as this informs and ultimately determines what happens on the ground – both externally in terms of engaging with communities and also internally by fostering an open, learning organisational culture. In an effort to gain knowledge and disseminate successful innovative business models, the MIF, in collaboration with the Innovation and Technology for Development Centre of the Technical University of Madrid (itdUPM),has commissioned a publication in which five innovative solutions involving partnerships at the local level are presented and analyzed. 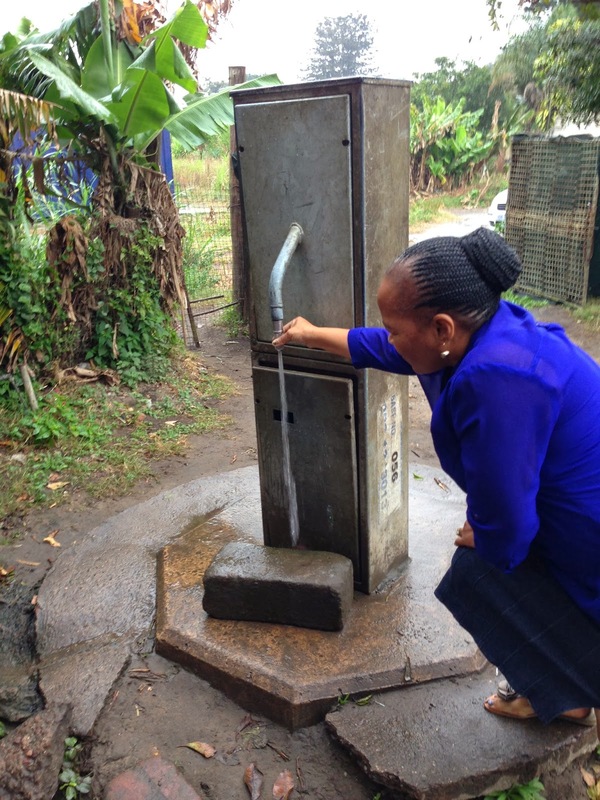 This is the second case study of the series and serving as a learning comparison with another region since it analyzes a water and sanitation service model from South Africa. To produce this case study, the MIF and itdUPM have collaborated with Building Partnerships for Development. BPD's WinS research projects launched... continued! Last month we talked about our experiences with WinS projects but what have we learned along the way? We have recently carried out a number of evaluations of WinS projects and programmes in Latin America and Africa including for the IDB, USAID and AusAid. A key finding is that sustainability of WinS programmes is not wishful thinking. That is a finding, yes! We cannot really take it for granted! The repeated view of latrines cemeteries is a good reminder of it. Indeed, in numerous schools, as evaluators find out, brand-new facilities are quickly degrading and about to experience the same fate as prior generations of toilets built under earlier interventions and which are already abandoned in the backyard. That clearly challenges us, our current approach, but does not alter the fact that sustainability is possible, and is indeed achieved by a minority of schools. Yet, our observations show that it often hinges on strong school leadership and proper follow up. Not surprisingly, such conditions occur in a few schools only. Our assumption at BPD is that until governments channel more resources to support WinS work and enforce monitoring, a catalyst is going to be needed comprising a clear combination of incentives and monitoring leading to greater stakeholder accountability. Figure 3: Ex-post evaluation in Guatemala – A surprise visit to a school in one of the poorest area gives great satisfaction: clean latrines, soap and water at the tapstand, filtered water, toilet paper and detergent available in classrooms! Abridged sessions of BPD’s WinS Partnership workshop, which we delivered at the UNC conference last year, for FHI360/CARE in Zambia in spring, and at the WEDC conference in Nakuru this summer, consistently highlighted the demand from practitioners for practical, analytical tools and guidance to run the multi-sector partnerships which form the institutional backbone of most WinS programmes. We have also provided some ‘PPP guidance’ to the FHI360/CARE SPLASH programme in Zambia. That assignment confirmed that in a number of countries considerable resources are available locally, regionally and nationally to reinforce WinS work. Numerous non-traditional actors, including private sector actors, philanthropic foundations, and organisations such as the Rotary Club and the Lion’s Club, are willing to join forces. There is much benefit to derive from their mobilisation and engagement through well-structured multi-sector partnerships. From that perspective, we suggest that WinS advocacy efforts and partnerships at local, regional and national levels should become a standard component of any WinS programme. Back on the partnership front, optimising the contribution of non-traditional partners requires precisely meeting their respective interests (e.g. core business, CSR, philanthropic). This means that tailored packages must be prepared for each partner. Ideally, each package should comprise a bundle of activities contributing both to the scaling-up (hardware and software components) and sustainability (incentives and monitoring) challenges of WinS work. We have gathered very interesting insights from these recent pieces of work. They have already triggered ideas on how to crack the WinS sustainability puzzle, and we are finalising a concept that we will trial as a pilot [please contact us if you have some interest in this]. At the same time, we have identified gaps in knowledge which the sector needs to bridge in order to address the institutional complexity of WinS work. We need solid foundations upon which solutions for WinS partnerships can be designed. By this, we mean that we require first and foremost a better understanding of the varied nature of those partnerships: their different shapes, their objectives, their evolution...That is the purpose of our first research project. Then, in order to engage non-traditional actors more strategically, we need to develop a deeper understanding of their input so far, and of the trends in their contribution. That is the focus of our second research project. Both research teams will share the progress of their work on this blog, including the challenges that such a novel type of research entails, as well as an outline of the key findings as they emerge. Watch this space! And contact us if you have special interest in this research. BPD’s WinS research projects launched! I spent a day in Paris at Sciences-Po at the beginning of the month for the kick-off meetings of two new BPD research projects, focusing on WASH in schools (WinS). It really feels good to initiate those projects, and for a number of reasons: First of all, they embody our growing interest and engagement in the topic and our commitment for enhancing the sustainability of WinS. They also reflect BPD’s standpoint, highlighting the institutional and partnerships dimensions of WinS work. Finally, this joint work with Sciences-Po PSIA (Paris School of International Affairs) is a première for BPD and we are hopeful that these projects mark the beginning of fruitful collaboration with this renowned institution. 1. To develop a typology to characterise, compare and strengthen WinS partnerships. 2. To analyse the nature and evolution of the engagement of private sector actors (and other non-traditional actors) in WinS work and, drawing from a partnership analysis of WinS work, make recommendations on how to enhance it. BPD has been here for 15 years and has not done much work on WinS until lately. Well, the nature of WinS interventions has evolved quite a bit in the past 30 years. It started as rather polarised on the hardware component of the problem, concentrating on the provision of taps and toilets. Then, software components, including hygiene promotion, the formation of health clubs and strengthening of WinS committees, were gradually integrated to seek sustainable hygiene behaviour change and ensure an appropriate O&M of the WASH systems. Arguably, the quality of both these components has now been perfected to a very satisfying degree and any programmes can now easily tap into the well-documented and easily available solutions to implement an integrated hardware plus software WinS intervention. Latrine cemetery in a rural school somewhere near Mombasa. Yet, despite all this learning, WinS programmes keep facing major difficulties to deliver sustainable gains. And amongst the key challenges faced, practitioners keep pointing the finger at the institutional complexity of WinS work and the difficulty to get local stakeholders to fulfil their part of the job so that kids can use clean, well-maintained toilets and wash their hands with soap. Now, at BPD we share the view that WinS programmes are very strategic interventions for the sector: the vulnerability of children to wash-related diseases, the appalling state of sanitary conditions in schools worldwide, and the fact that these are probably the best places to instil new hygiene behaviour in the population are sufficient reason to justify more collective efforts on WinS. The progressive recognition in the sector that a sustainable solution to the problem requires a deeper understanding of its institutional dimension and corresponding pragmatic solutions has prompted BPD’s mobilisation on the subject. The work that we have been carrying out in the past three years has boosted our conviction that BPD’s expertise in the field of multi-sector partnerships (MSPs) can contribute to solve the WinS sustainability puzzle. Watch this space for the next instalment! Because our terminology shapes our expectations that then shape our behaviour, over the last several years, BPD – and others, of course – has grappled with the need to find some kind of definition for the term 'partnership'. As noted in the last blog, the term is used widely to refer to all kinds of relationships. The pressure is admittedly strong for organisations across the public, private, funder and civil society sectors to use such terminology to send a variety of signals. infrastructure or construction projects between the public and private sectors as two signatories to a contract. Partnership for us is more about the looser more iterative, more inclusive, more horizontal, unregulated multi-stakeholder arrangements to which the fairly constant calls for more “working together” seem to be referring. The term, however, is misleading – working in partnership suggests harmony whereby the reality is more often than not a lot of hard work. This part is a fairly common description and offers few surprises, representing mutual need and mutual obligation as well as hopefully some sense that a particular partner is the best (or even only) option to help us do what needs doing. ...whereby individual organizations cannot purchase the appropriate resources or competencies purely through a market transaction. We have no doubt that many partnerships will require money changing hands and some form of paperwork that binds the partners. From working with dozens and dozens of partnerships over the years, we’ve seen that such transactional arrangements tend to dominate the discussions between partners – yes, generally speaking the one with the money calls the shots or dictates the terms. The paying party generally (though perhaps with some timid negotiations from the contracted party) determines what the deliverables will be and their timeframes, sets out the penalties for non-delivery, and then takes ownership over and credit for the deliverables once they have been completed. Through various partnership building tools and frameworks, BPD has sought to focus more on the mutual need and mutual obligation found in the definition above. Crazy as it sounds, we have usually encouraged partnerships in their early stages to put off the discussions of finance for as long as they can. Once introduced, the finances then distort every conversation thereafter more towards a discussion of short-term activities and away from longer term goals, towards important but overly long discussions about procedures and day-to-day management, and reporting that is input-output rather than outcomes or impacts focused. Putting off these financial negotiations might allow partners to dedicate more time to forging a robust relationship - focusing more on strategic objectives, partner incentives, other essential resources and clarifying roles and responsibilities. delighted that the theme of Stockholm World Water Week this year is Water Cooperation: Building Partnerships. Our name is a bit of a giveaway that this is a topic that is very close to our hearts! Over the years, a euro or even a dollar for every time the term ‘partnership’ has been mentioned in Stockholm and other global forums (not to mention more recently in digital media) would have gone a long way in providing significant investments for the sector. The need to work together has been recognised for some time. The challenge of how to work together though has largely gone unaddressed. This involves the hard work of rolling up sleeves and negotiating on who will do what and when and with what resources. BPD’s own analysis, having worked with dozens and dozens of partnerships at all levels (local, national and international) over the last 15 years, suggests that the more difficult partnerships are those made between ’familiar partners’, where assumptions are not verified. Obviously contentious or distrustful partners are busy keeping an eye on each other, which can ironically often lead to a more honest exchange about what is working and what is not. Partnerships can even fall apart – and often do - for any number of reasons. Common causes are branding problems or lack of recognition of a partner’s contribution. Mechanisms for and timing of communications (both internally between partner organisations that keep everyone ‘on board’ and externally with wider stakeholders) are often not sufficiently thought through. This is where individual partner risks become most threatening to the partnership unless there is some airing of assumptions as early on as possible. This means focusing on how the partnership will make decisions, how it will incorporate an understanding of different stakeholder’s risks, how it will deal with a partner’s non-performance, etc. Otherwise external events, changes in personnel who bring new ways of thinking (or just want to make their mark), shifts in resource allocations, or other jolts can all destabilise a partnership quite quickly. While the term is used to death, some (rightly) question whether forging partnerships is the right approach in all circumstances. Sceptics suggest that partnerships can create perverse incentives or even be used as a stalling tactic, or to co-opt opponents, or allow certain partners to abdicate their responsibilities because ’the partnership is taking care of that’. In the run-up to World Water Week, BPD will use this blog space to put forward some findings from our work over the years in an effort to shift the discourse in Stockholm away from the platitudes of ’needing to work together’ more towards questions of when is it appropriate or not, and if appropriate, how should (potential) partners go about it. Over the years, BPD has seen the good, the bad and the ugly with regard to partnership practice. We’re keen to put our learning out there for debate. Practice (SanCoP), of which BPD is one of the convening organisations. Following on from this, five SanCoP members have co-authored a discussion paper: Learning from failure: lessons for the sanitation sector. We presented the paper at the most recent SanCoP workshop, held at University College London in April 2013. Below is an abstract. We would love to hear your feedback and ideas using the comments feature below. Stephen Jones and Nicola Greene have also co-authored a shorter commentary piece based on ideas in the discussion paper: Crossfire: Can ‘admitting failure’ help the WASH sector learn and improve its work?, published in the April 2013 edition of open-access journal Waterlines. 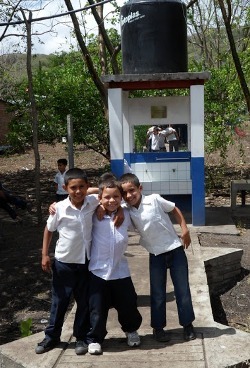 For examples of 'failure' in sanitation and also water projects, see this ongoing blog from Improve International. 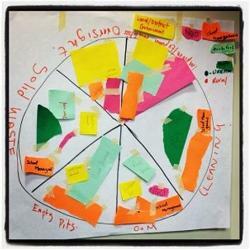 This paper explores the idea of learning from failure in the sanitation sector. 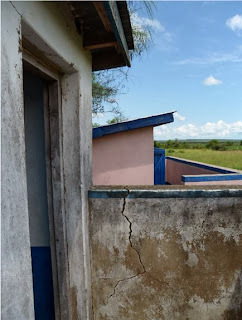 The recent trend of ‘admitting failure’ in aid and development forces sanitation practitioners, researchers and policy-makers to ask if we can and should address failure more openly in order to improve our work. The ideas in this paper developed from discussions at a workshop on ‘learning from failure’ convened by the UK Sanitation Community of Practice (SanCoP) designed to kickstart this debate. We first discuss the concept of failure itself and identify different approaches to learning from failure relating to sanitation. These include acknowledging past failures in order to learn and adapt, and planning for ‘safe’ future failures through deliberate experimentation and innovation. We also argue that a series of further steps are required: understanding relevant previous approaches to learning from failure in the sector; recognizing different types of failure; seeking different actors’ perspectives on failure; and framing the debate about failure constructively rather than negatively. In the second part of the paper we examine different practical examples of how actors in the sanitation sector have tried to learn from failure, to assess how this happened and what changes resulted. 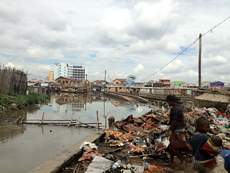 In the final section of the paper we conclude with suggestions for how individuals and organisations working in sanitation and international development more widely can learn from failure. We also propose the UK Sanitation Community of Practice (SanCoP) itself as one example of a ‘safe space’ in which people can meet to discuss and learn from failure. “License to Play” WASH in Schools (WinS) session held by BPD at UNC Water Health and Policy Conference 2012. Acknowledging that sustainable WASH in Schools (WinS) programmes require effective local-level partnerships, we suggested that a dedicated ‘WinS partnership toolkit’* could help stakeholders build and manage stronger relationships. As a group, participants identified an array of stakeholders and institutions operating at both the local and district level and grouped them into five broad categories - School, community, district, private sector and external support. 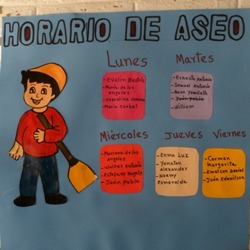 School: Students and teachers trained as hygiene educators, school caretakers, school management committees, student clubs, parents and Parent Teacher Associations. Community: Mothers’ groups, local entrepreneurs (e.g. soap/toilet paper suppliers), local water boards, government institutions (e.g. the Ministry of Environment or municipal mayors). Private sector: At community level this included private health institutions, community health workers and local benefactors. District: Local civil society, research centres, health facilities and the Ministry of Education. Although identifying possible WinS stakeholders was straightforward, it was an eye-opener for many participants who had not previously realized how numerous these can be and the wealth of resources they potentially bring to WinS programs. Not being context specific made the exercise useful for comparing the types of people and organisations involved from one country to another. School level: Improving the overall health and wellbeing of students and the school environment, and promoting gender equality (by increasing female attendance). Community-level: The desire to have a ‘good school’, where students can actually learn and achieve their full potential and the need to cultivate a sense of security within the community and promote good health. Private sector: Profit, corporate social responsibility (CSR) and in some instances long-term core business development. External agencies: Reputation, existing relationships with schools, and grant/ donor requirements. The limited time made it impossible to separate the incentives of the various stakeholders in each category, which led to some generalisations and imprecision. However, the systematic identification and ranking of stakeholders’ incentives was something new for many and was found to greatly help understand some of the dynamics at play in local-level WinS partnerships. 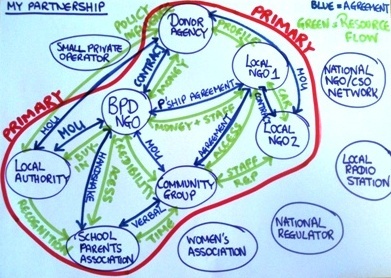 When carried out on the ground by local stakeholders of WinS programs, such a process (which will be much more accurate when context-specific) should make partners’ behaviour more predictable and help stakeholders understand the fundamental reasons often underlying greater, lesser or shifting engagement. Partners will get to know each other better and the partnerships they form will become more self-reflective and responsive. incentives, two groups went on to determine their likely respective functions. One group focused on hardware functions; the other on software functions of a typical WinS partnership. Simply put, hardware functions were defined as the operation and maintenance of water supply (pipes, toilets and treatment devices), solid waste management and oversight of water quality. Software functions referred not only to the provision of consumables (soap, detergent, toilet paper etc.) but also to the monitoring of WASH standards. Relative contributions of the different stakeholders to each function were then discussed. Reviewing the wide range of activities necessary to achieve a basic level of sustainable services enabled participants to clearly grasp the complexity of WinS work. Defining stakeholder functions shed some light on a possible range of scenarios, roles and responsibilities and the resulting negotiation needed. Obviously it was not possible in the short timeframe of the session to go into depth or consider context-specific cases. A number of critical points could not be covered, such as the issue of partners’ compliance. While formal attribution of specific roles and responsibilities will clarify the ‘rules of the game’ for partners, clearly it will not dissipate all tensions between partners nor guarantee their compliance to what has been agreed. 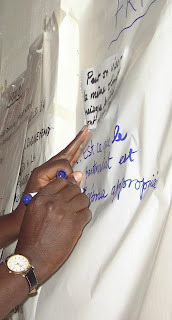 Accountability is another important issue: Getting local partners to agree on viable accountability mechanisms (i.e. ways to foster compliance, transparency and responsiveness) generally proves very difficult. BPD’s experience suggests that this process will be more productive if discussions about stakeholders’ incentives accompany the development of these mechanisms. This mini-workshop allowed participants to grapple with the unique nature of WinS partnerships, focusing on the local level (school, community and district), where stronger and more accountable partnerships are particularly needed. In addition, by identifying the respective incentives of the numerous and diverse stakeholders to engage in WinS work, the group started to envisage the sort of tensions that could potentially arise in these partnerships. Acknowledging, and understanding such tensions from an incentive perspective enables ‘interest-based’ negotiations, which are far more productive than ‘position-based’ confrontations. Using tried and tested participatory partnership tools with more local-level WinS programmes could lead to better managed and more effective partnerships on the ground – an essential step towards sustaining project gains. BPD found the UNC session very thought-provoking and is keen to stimulate further conversations on this topic. Join the conversation on the LinkedIn SanCop (Sanitation Community of Practice) group. Download BPD’s SWASH+ WinS evaluation (executive summary and recommendations) of this IDB/ MWA initiative in Central America. Watch a short video on the SWASH+ WinS programme in Kenya, highlighting the need for collaboration among parents, students, teachers and governments to improve WinS in the long term. 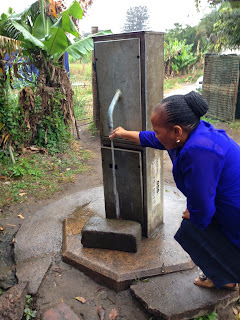 BPD’s goal is to enhance and increase water and sanitation provision in poor communities by strengthening partnerships. Challenges around water and sanitation service delivery in developing countries are not merely rooted in gaps in technology or finance. BPD promotes more efficient and effective relationships between stakeholders across the public, private and civil society sectors. Active since 1998, BPD (Building Partnerships for Development in Water and Sanitation) is the sector leader in providing non-profit, neutral and independent guidance that both challenges and supports water and sanitation policymakers and practitioners. BPD Water & Sanitation. Simple theme. Powered by Blogger.